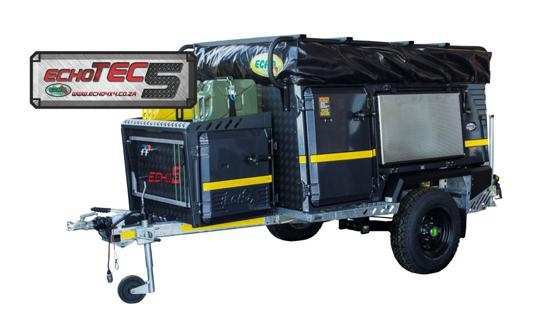 The Echo Tec 5 Off-road trailer is the flagship trailer of the Echo 4×4 range. It is constructed of the most superior materials and designed to be lightweight yet robust. The Echo Tec 5 is manufactured with independent suspension giving this trailer the maximum stability and off-road performance. It has the ability to handle the most severe conditions. Luxuries such as a gas geyser and gas stove makes you feel right at home no matter where you are. The nosecone has been fitted with a fridge slider inside that can fit a 90 liter fridge/freezer. It has also been fitted with a wood rack on top. Wash basin and drying rack are located below the hot and cold water taps. The kitchen unit has ample storage space for groceries. The Echo Tec 5 is an all inclusive trailer. All these features listed above are standard in the Echo Tec 5 Off-road trailer. The only optional extras are the axle width and the trailer rack that allows you to load your bicycles or a canoe on top. Now you never have to leave them behind when going on your adventures. It is not often that you get all these features packed into one ALL INCLUSIVE deal.